One Filipino dessert I enjoy is bibingka. That is, if it doesn’t contain rising agents that leave a nasty, astringent aftertaste. Unfortunately, many of the local Filipino bakeries “cheat” and add far too much baking soda or powder, which detract from the sticky goodness. I prefer rice over cassava bibingkas, mainly because I’ve yet to taste a superior one made from cassava. Some variations top the pudding with Cheddar or Edam cheese, which, frankly make me think of better uses for those cheeses. Some variations top it with a dark sugary-caramely layer, which I love and attempt to make here. My version steams the rice, rather than boiling then baking — I’ve found that steaming resulted in fluffier, more tender rice grains. This recipe will fit in a large soup or cereal bowl, which would fit in a 9-inch steaming basket. You could double this and use an 8-inch or 9-inch round baking pan, but you’ll need a really large (at least 12-inch in diameter) steaming basket to accommodate the pan. 1/2 cup long-grain glutinous rice; a brand from Southeast Asia (Thailand, Vietnam) would work. 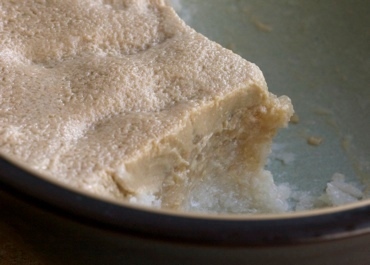 Avoid using a short-grain like Japanese mochi, as the texture would end up being a bit too sticky. Put the garnish ingredients into a food processor (or a spice/coffee grinder in small batches). Pulse briefly so that the peanuts and sesame seeds are minced finely, but not made into a paste. Cover the rice with water, and soak for at least 1 hour; overnight is fine. Drain the rice, then place it, the light coconut milk, sugar and salt into a heat-proof bowl that can fit into your steamer. Get the water boiling for your steamer, put the bowl of coconut milk-rice in it, then cover and steam over a energetic simmer. Mix together the ingredients for the cream topping, and gently pour it on top of the coconut milk-rice when the latter has been steaming for about 30 minutes. The “right” time is when all but a tablespoon or two of coconut milk remains on the pudding, when the rice peeks through the surface of the liquid. This was written by sairuh. Posted on Saturday, October 25, 2008, at 12:38 pm. Filed under Food. Tagged pudding, recipe, rice, Southeast Asia. Bookmark the permalink. Follow comments here with the RSS feed. Post a comment or leave a trackback. My mother made rice dduping when I was growing up and your post reminded of those wonderful days when, after the dduping was cooked and poured into a large bowl to cool, my mom would hand me a large spoon to clean up what was left sticking to the pot. That was the creamiest part! In Cuba, the rice dduping is flavored with cinnamon and lime peel your photo took me back to those days of comfort.